The MC2KW mono-block amplifieris designed to exceed the demands of true lifelike playback levels, capable of delivering 2,000 watts of continuous power and 8,000 watts of peak power into 2, 4 or 8 ohm speakers. But sheer power output is just the beginning of the story. The MC2KW’s unique design incorporates three modules. Two 1,000 watt power modules each contain half the circuitry and a power supply. The output module houses the input and output connections, meter, and output transformer; it also functions as the control center. The MC2KW features McIntosh's Quad Balanced circuitry design which, in the process of creating such extraordinary power, cancels virtually all noise and distortion that may have been introduced into the audio signal. This leaves a clean signal that even when amplified to high levels is still as pure as when it entered the amplifier from the preamplifier. 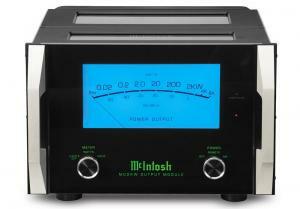 Other McIntosh technologies are included in the MC2KW. The world famous McIntosh Auto-former guarantees your speakerswill always receive full power regardless of their impedance, while Power Guardwill prevent clipping that could damage them. Three sets of speaker connections are included to allow for tri-wiring your speakers if they are so designed. Sentry Monitor™is a fuse-less short-circuit protection circuit that disengages the output stage before current exceeds safe operating levels and then resets automatically when operating conditions return to normal. Both balanced and unbalanced inputs are available for connecting to the rest of your system. The large, blue watt meter is not only mesmerizing to look at but also provides a swift and accurate reading of the amplified signal. All three modules are housed in a beautiful polished stainless steel chassis that compliments the classic glass front panel, knobs and brushed aluminum handles along with nearly any room decor. The MC2KW is perfect for both 2-channel music lovers as well as in home theater systems. Contact your local dealerto learn more.